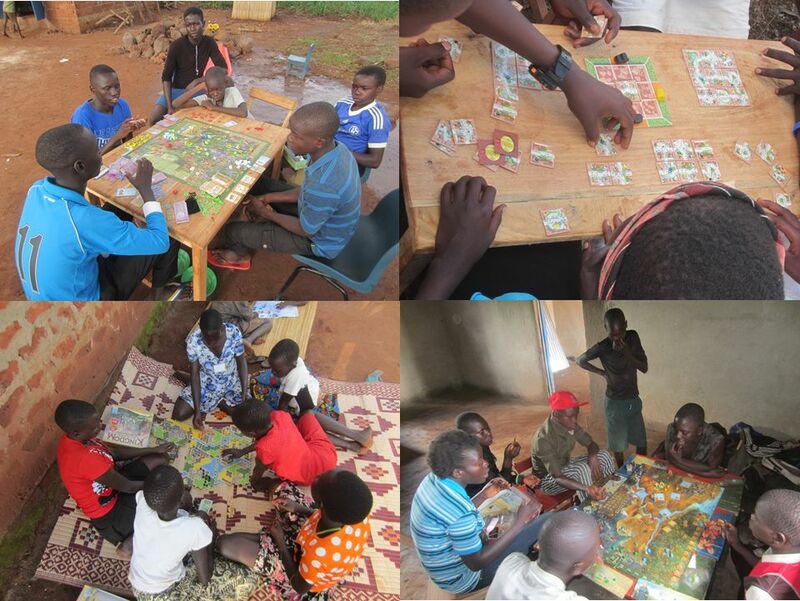 Back in 2017, one our young trainees said “Let’s do something this holiday in the village – perhaps we can take some board games.” This germ of an idea spread amongst the other youth and the concept for the Uganda Village Boardgame Convention was born and through this now ten village board game clubs exist, with more planned for this year! The lives of children in villages can be repetitive and their life experience is minimal compared to their peers growing up in towns. Their knowledge of the rest of the world does not increase as they get older and so some remain destined to remain in their villages for their whole lives unable to develop a vision for their future. However, small interventions can make a real difference in developing the vision and experience of some of these children. Games provide a platform for discussion about new themes and historical event or world issues and these change the way that children think about their lives. 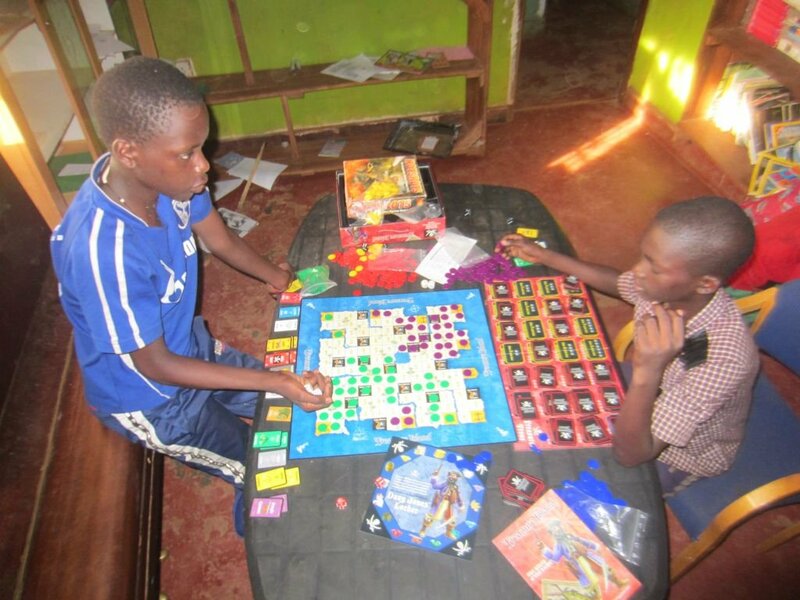 Additionally, some children find the village life dispiriting, with little mental challenge or stimulation and these respond to board games with incredible enthusiasm, diligence and responsibility. 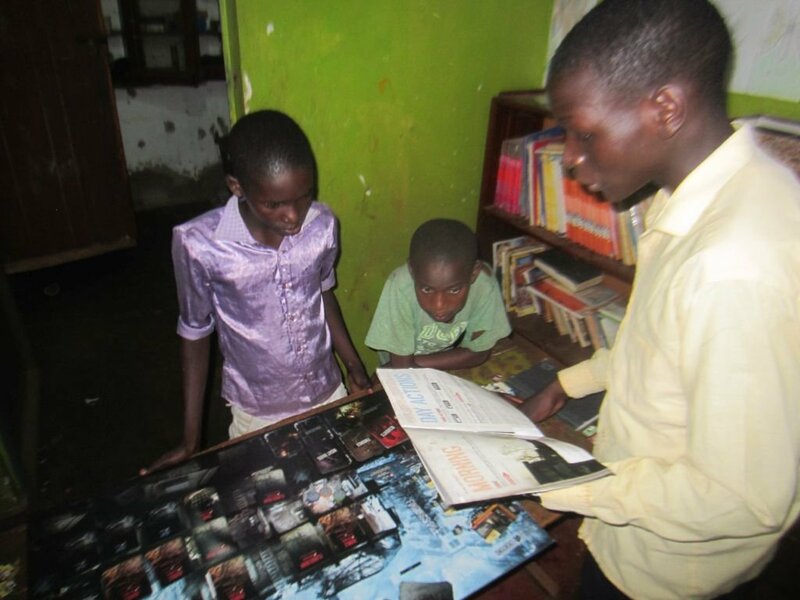 Enthusiasm leads them to wish to introduce board games they have learnt to other children they know and even to wish to start other clubs, if the children they know live too far away. 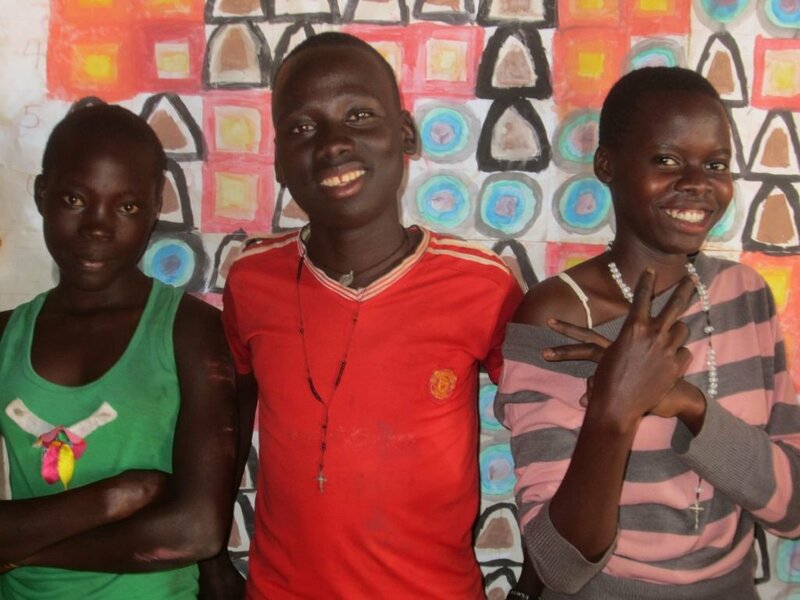 Cinderella (aged 12) founded a new village club in her district of Omoro and both clubs are now successful. Diligence means that they take time to understand the rules completely, so that they play the game properly within the rules. Learning the rules usually means reading and understanding rule books, since there is no Rahdo or Dice Tower to help them learn, once we are gone. Responsibility leads the children to be able to look after the board games in their club, putting them away carefully after use. This is a skill children living in poverty rarely learn, as they are often lacking any possessions of value to them. 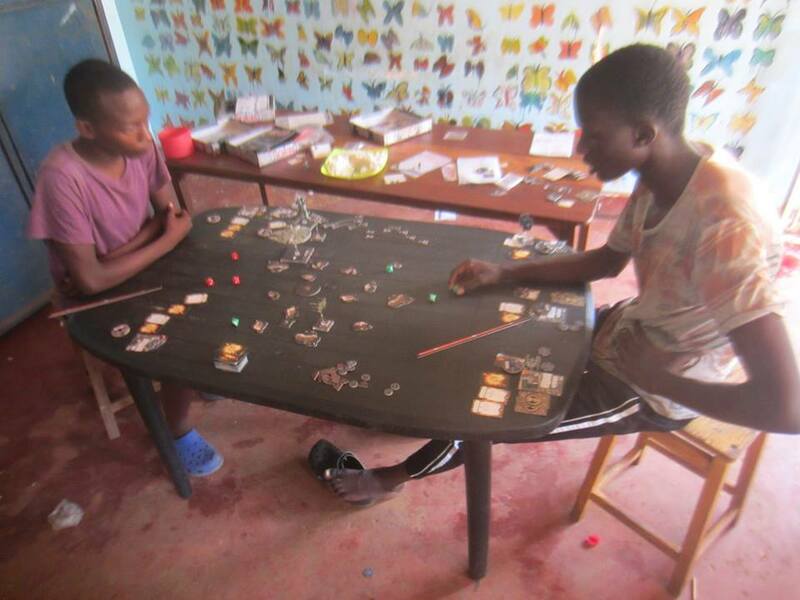 The children themselves tell us that the games help them forget their village lives for a time and imagine being in the places depicted by the game, whether it be on a railroad in the USA (Ticket to RIde), speculating in Africa (Mombasa) on a galactic space ship (Galaxy Trucker) or even running a company exploiting the planet surface of Mars (Terraforming Mars). In addition to this, poverty can sometimes cause people to have to focus on their own survival and this means that outside the immediate family children might not learn teamwork. 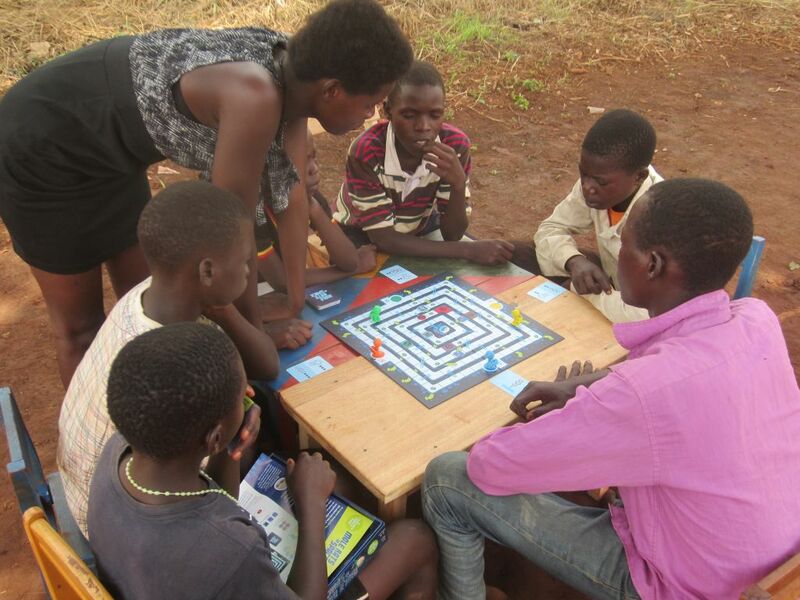 Co-operative games and games where partnerships are needed to win, such as Rex or even Diplomacy, can help enable children to learn how to work with each other to achieve a goal and this is crucial in the village environment and solutions are rarely there that a single person can solve alone. Last year, we implemented a “Molerats in Space” team tournament game, which really went well and for many this game was the one they enjoyed the most at the 2018 Convention. 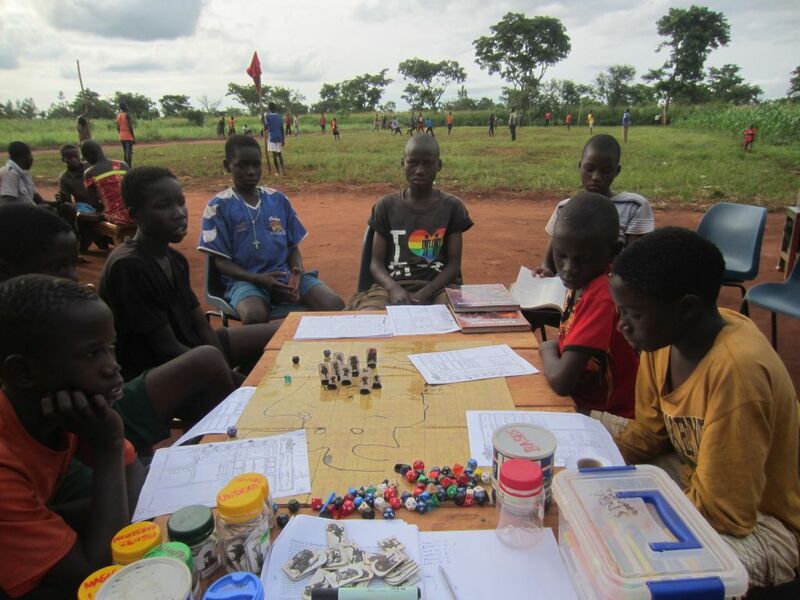 We handed out our tournament copies of the game to the participating teams, so now these games are spread out amongst our village clubs in Northern Uganda. In 2018, we housed over 200 people at the Convention and it is hoped that this year we can work with even more, if we can raise enough money. For 2019 we also hope, with your help, to expand our reach into new areas, through board game outreach sessions, which will take place ahead of the Convention itself. Our 2-acre site in remote Koro Barogal also requires some development, if it is to house a larger number of people and we hope that we will be able to extend our dormitory building to include enough space for at least another 50 people on-site. Toilet facilities are also at a premium and we will need to upgrade these, as a matter of urgency. 1. A demonstration 7-player event for Twilight Imperium III, which we will have centre stage in our brick shelter! 3. A Burley Games “Treasure Island” tournament. This game is very popular, as it has competition and a bit of luck thrown in. With six players it is still fast and can be played quite quickly. 5. How to make your own Omweso set. 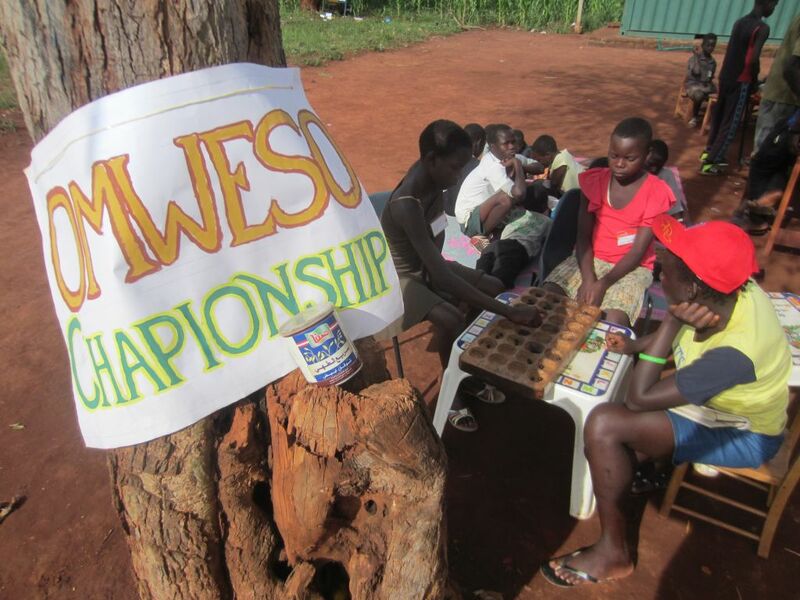 Many of our young people are now engaged in making omweso sets to encourage the development of this indigenous game and also bring it more international awareness. 1. The Gulu Youth Omweso Championship. 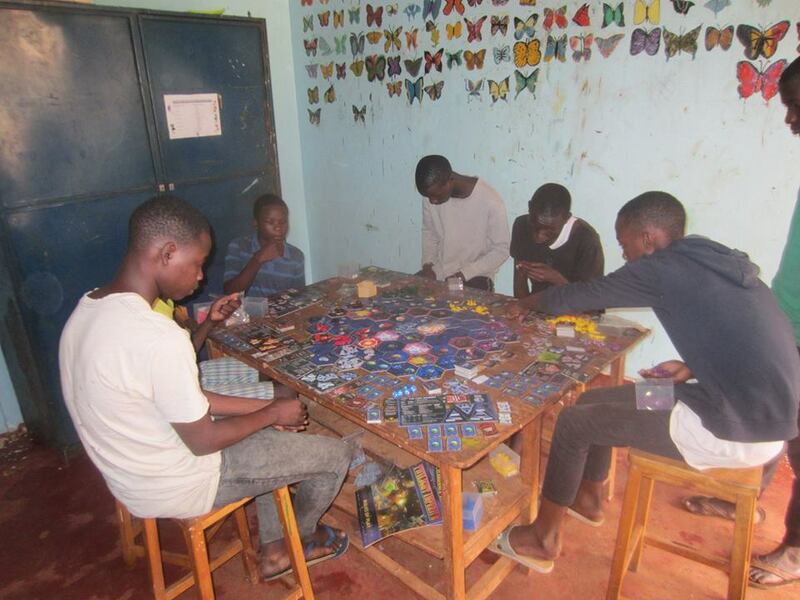 Our mission is to develop board games in Uganda, not just international, but indigenous games, such as omweso, which is an excellent planning and counting game, which can be very skilful. Each year we teach new children to play and nurture those who already know, by giving them a chance to compete against others. Art becomes a game using the Art Arena technique, which encourages children to co-operate to create the most visually-effective painting, as they balance the different elements, which each team is responsible for. 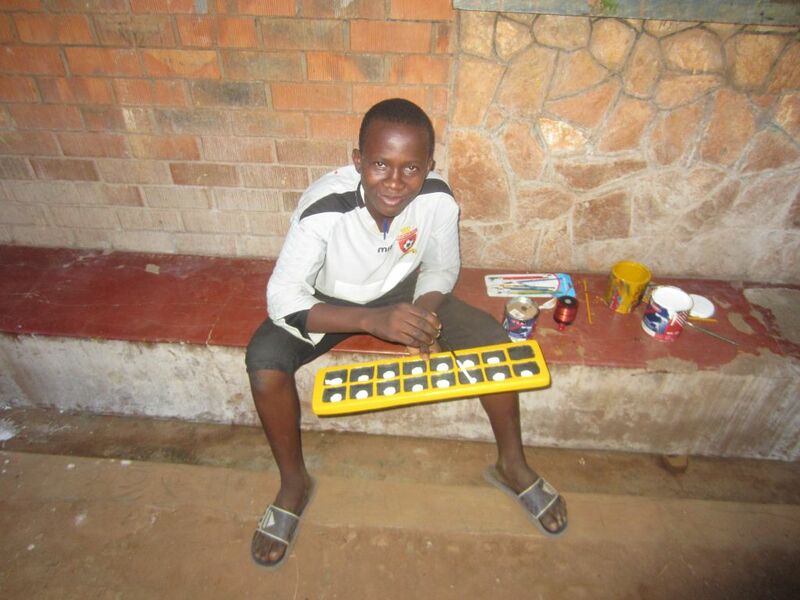 Our Cohort 4 youth, Innocent Akera, has been instrumental in developing this project. DR Congo was a challenging game for everyone in our toughest category. Turbo Taxi is also a surprisingly hard puzzle game, though everyone can try. Kingdom Builder has always been an easily accesible game, which is hard to win and Legends of Andor, gently introduces players into the world of fantasy, with miniatures the children can understand. This year, we have over 200 new games, donated by gamers worldwide, we are hoping to bring to the Convention. Roleplaying is quite a challenge for rural children, but we have grown their capabilities over the years through developing their imagination and creativity. The LARP last year – Battle against the Lich King – was really successful. We made 50 dwords and other foam weapons and had multiple teams, each trying to be the one to defeat the lich king. It was also our chance to run some puzzle-solving and develop the creativity of the participants. We believe the inventiveness of children, who have lived different lives, can create new and exciting play mechnics and genres, geared to their personal experience. We have several games now being worked on in a while variety of different themes. 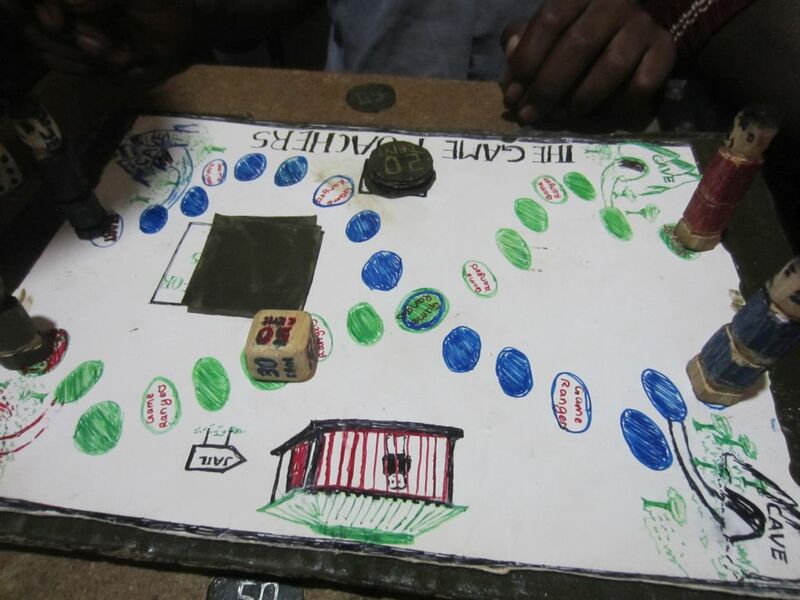 It’s not that easy to walk into villages and find enthusiastic boardgamers! Quite rightly, local officials forbid this and so we tend to grow our boardgamer “base” organically, utilising our own boardgamers to select the friends they know who will be interested. Now we have our own base of a few hundred, we can utilise these groups to find more. 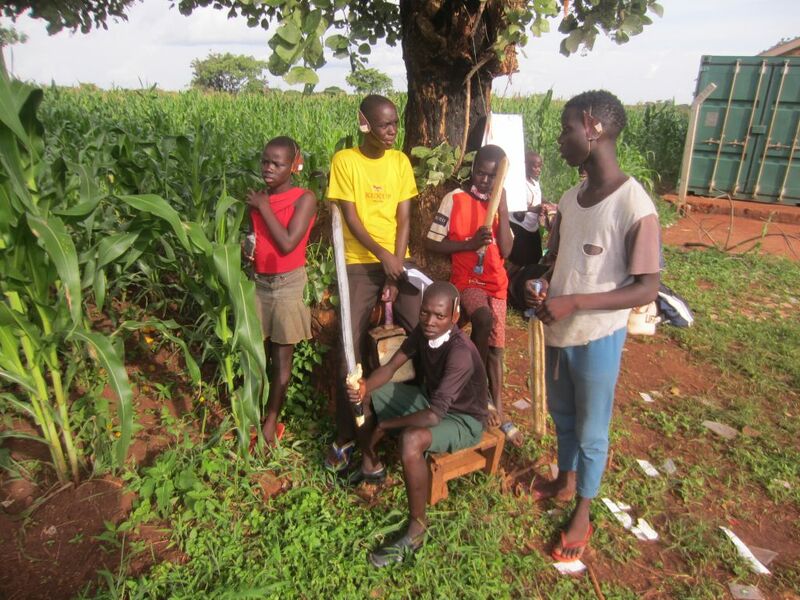 This year, during the Convention discussions, a number of the children on our Butterfly social entrepreneur training programme asked whether they could be part of this recruitment programme, going back early to their villages in the holiday, so that they can mobilise a team of youth for the Convention this year. The potential would be to start up a further six clubs in the North – two in Pader district, one in Gulu district and three more in Omoro – one in Koro Abili, one in Owor and one in Palenga. Lastly, you can probably see that we believe strongly in the youth of Uganda to achieve the needed change in their country. You can learn about the work we do at this YouTube Link. We plan the events with our youth and involve them in almost every process. They take responsibility for teaching, registration, banners, content, choice of food and activities, the filming and even the games we take with us. The staff team ensure everything is safe and within budget and ensure all of the children arrive on time, are fed, have somewhere to sleep and are returned to their villages safely at the end of the Convention. All our staff team are also gamers and will be teaching games during the Convention. You can come to our Convention, which will take place 22nd – 25th May 2019 at our Centre in Koro Barogal, in Gulu District. It’s more of a backpacker’s trip, though, as the site is remote and you will have to stay in nearby Gulu, where there are reasonable hotels, but nothing 5 star. We can organise everything, from hotels to transport, though you will have to procure your own flights to Entebbe, Uganda. If you would like to teach some games to the participating children, then that can be arranged. English skills vary and we will ensure you are given a group, which can be communicated to in English. If you would like to have a stand at the Convention, we cannot offer this, as we do not normally have anyone buying products, as our focus is rural youth, who don’t have any spending ability. We support them with food for the whole Convention. However, if you do decide to visit us, then you will need to pre-arrange, so that we can prepare adequately for you. We can handle a fair number of people on site and also organise your food during the Convention. Please contact us on socentafrica@gmail.com if you plan to visit and we can discuss the possibility with you in detail. You would be very welcome. The Convention Programme is subject to change but will be formalised over the next few weeks. We hope that we can find supporters again this year and make it as brilliant an event as it has been previously.